This entry was posted in Books and tagged Anthony Hope, Arthur Ransome, Dorothy Dunnett, Francesca Simon, Miss Read, Patrick O'Brian, Richard Hull, Ursula Bloom by Katrina. Bookmark the permalink. I have a copy of The Dolly Dialogues that I have had so long that I have no recollection of acquiring it. Maybe it arrived of its own volition, bursting through my front door? I love that image. I am going to insist from here on that all my books arrive in this fashion. Me too. I swear I have no idea where they all come from! It wasn’t me – honest. Send A Fax is the last in the series of mysteries. It might help to read Dolly and the Bird of Paradise first, which is also my favorite in the series. Thanks for that info. I suspect I’ll have to resort to the internet to get the others. All of these titles are new to me except for Miss Read, and I absolutely love all of her books. I have some of her books and a few others on audio cassette version. I need to find a way to put them on either cd or digital format. I could be interested in several of the other ones that found their way into your house without your help:) Interesting tidbit about your ancestor. How did you learn about that? I always knew that a several times great grandfather or uncle had been transported. There’s a massive obelisk in Edinburgh which commemorates him (William Skirving) and a few others, it’s known as The Martyrs Monument. I met someone who happens to work in Register House in Edinburgh and he said they had a lot of documents about him and his trial so I’ve been able to do a bit more research on him. I love the Miss Read books too and have read both of the ones that have ‘gatecrashed’ your house! As you know I also have a copy of Excellent Intentions and hope it’s as good as The Murder of My Aunt. I haven’t read the other books – I thought I had both the O’Brian book and the Ransome ones, but when I checked I do have books by both authors – but different titles, The Yellow Admiral and Coot Club (and haven’t read them). I think I have read Secret Water as the description on Wikipedia is so familiar to me – but I don’t have a copy, so can’t be positive. I think there was a TV programme not so long ago about Arthur Ransome and his Swallows and Amazon books – so maybe that’s why I think I’ve read Secret Water. O’Brian has written loads of books, but I’ve never read any of them. I’m trying to collect the Ransome ones, especially as we were in Ullswater last year and apparently that area inspired him to write the books. I missed that TV programme, I’ll have to look out for it coming on again. I bought most of the O’Brian books hoping my ex-sailing husband would read them. He’s not much of a reader and thought they might appeal. So, far, they haven’t. But I’ve read a couple and liked them. What a shame he wasn’t smitten with the reading bug. Maybe when he no longer needs to do any painting he’ll start reading! I haven’t read any of the Miss Read books but I recently purchased the first Fairacre book (A Village School) so I can give them a try. I want to read the Richard Hull book that you got. I might have bought it recently (or it may still be on my wish list). I have read a few Miss Read books, I think they’re good light reading – for when the world news really gets you down. I love the Patrick O’Brian books, although I sometimes struggle with all the nautical terminology. That’s an interesting fact about your ancestor and HMS Surprise! I have read a few of Dorothy Dunnett’s contemporary mysteries and I don’t think they compare to her historical fiction, but they’re still quite enjoyable. I doubted that Dunnett’s contemporary books would come up to the standard of her historical books as they are really great. I think I’ll read the O’Brian one soon-ish although I’ve never read any books like those ones before. I wonder if the ship Surprise is described much in the books. I know it was originally a French ship which was captured by the British Navy. I just LOVE it when you show a good hoard of books you’ve rescued from the bookshop. I’m sure I’ve probably mentioned this before, but I’ve always wanted to try a Miss Read novel. They look like excellent comfort reads. I must try one. They are in the libraries here and fairly inexpensive as e-books. On the list. I’ve just bought two more bookcases! I think comfort read is a good description of the Miss Read books, get them from your library. My mother-in-law enjoyed them and I had to be careful which books I gave to her to read as she was rather strait-laced. 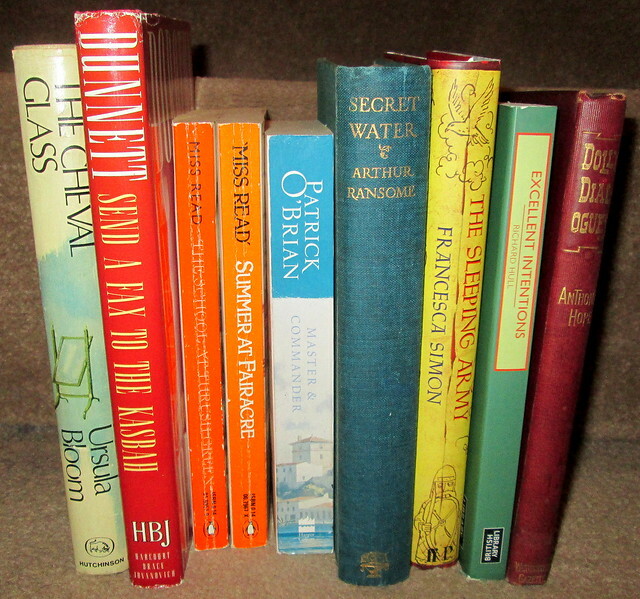 I love all the ‘Miss Read’ books; also have enjoyed all Arthur Ransome’s including Secret Water. With all the Brexit chaos never being off the news I think Miss Read and Ransome will be necessary reading. I haven’t read any of them but they do look lovely! I wish I had more second-hand bookstores nearby. Secondhand bookshops seem to be dying out although most cities in the UK have Oxfam or Shelter bookshops and they are usually really good. I love them as you just never know what treasures you might stumble upon. Thanks for dropping by and taking the time to comment.